Lasse Bjerre will guest for Panthers. A former Panthers title hero is bidding to end their unbeaten Premier League record tomorrow night (May 29). Richard Hall was a key member of the city side that roared to Elite League glory back in 2006. He remains popular with Showground supporters despite enduring a torrid return to the club last season when he eventually stepped down from the side after only a matter of weeks. But he is back in considerably better form after being drafted in by Berwick Bandits in the early weeks of the current season. And he reckons a tasty Friday tussle is in prospect between two in-form yet injury-plagued teams . Hall said: “Peterborough will always be a special place to me and I can still remember that title win of 2006 like it was yesterday. “The Showground is such a good track to ride and I’m just gutted it didn’t work out last year when the club brought me back. “I came in at a tough time late in the season and I put myself under far too much pressure. It wasn’t happening for me and that’s why I decided to stand down because I was just wasting my own money and that of the club. “I’ve invested in a lot of new equipment since then and crucially I am enjoying my speedway again. “This is the first time I’ve been at reserve in the Premier League since 2002 and I’ve been scoring well. “I’m expecting a really good meeting tomorrow and hoping for a few more points. Panthers ave called in Lasse Bjerre to guest at number one and will also operate the rider replacement facility for sidelined Lewis Blackbird. Berwick are also troubled by injury problems after losing two riders in the space of as many meetings during last week. 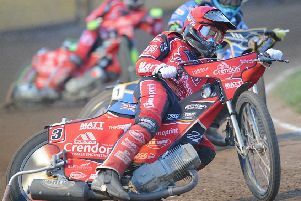 Czech ace Hynek Stichauer suffered a broken ankle as they made KO Cup progress at Ipswich last Thursday before ex-Panthers man Claus Vissing suffered knee ligament damage in a Saturday spill in a league win over Redcar. They have booked Jan Graversen of Redcar to replace Stichauer and turned to former Showground star Ryan Fisher to fill the Vissing void. They are also expected to have Thomas Jorgensen missing due to a fixture clash in his native Denmark. Panthers surrendered top spot without turning a wheel in league action as Somerset jumped to the summit following a thumping away win at lowly Scunthorpe on Bank Holiday Monday. The Rebels are top courtesy of a superior points difference, but they have ridden in one more meeting than Panthers.